It is extremely difficult for anyone to objectively justify who should get the reservation and who should not. Reservation and Unemployment have been two of the most vexing issues we’ve been facing since Independence. If Patidars demand reservation in Gujarat, Gujjars demand it in Rajasthan, and many states like Telengana want to give reservation for Muslims, even as Tamil Nadu has managed to give 69% reservation against 50% in the rest of India. SC-STs who have historically been denied access to formal education were always assigned the lowest level (often menial) jobs and were never part of the social, political and economic power structure. Since oppression, inequality and discrimination existed almost all through known history, they surely require some out-of-turn access to education, jobs, political power etc, which the nation gave them constitutionally in the form of Reservation (15% for SCs and 7.5% for STs) for a limited period. Though private educational institutions were required to conform to Reservation Policy, private companies are not bound by the reservation policy. It has since been extended indefinitely because, despite the reservation, their representation in education and Government jobs hasn’t matched their % of Indian population. Though even private educational institutions were required to conform to Reservation Policy, private companies are not bound by the reservation policy. Subsequently, some other sections of the society who were not as disadvantaged as the SC-STs but were considered disadvantaged in some ways, fought for and secured reservation under a new OBC (Other Backward Classes) category. Many of them have benefitted much more than SC-STs and their share in education, jobs etc reveals this. However, it’s also a fact that some sections among OBCs have benefitted a lot less than the others. It is in this context that creamy layers (children of those who earn₹ 8 lakh a year or more for 3 consecutive years) are excluded from reservation. Most of the demands for additions to OBCs is vote-bank politics, though there may be justification in some cases. It is extremely difficult for anyone to objectively justify who should get reservation and who should not. So, it has become a matter of political string-pulling. Mighty ones getting reservation will make bad policy. If seven decades of reservation has not been enough to ensure that SC-STs are able to compete on equal footing with the rest of the society, it clearly reflects on the extent of damage their historical subjugation has done to them. So, continuing reservation for SC-STs is clearly justified. It is the policy of continuing reservation for OBCs (and extending it to economically weaker among Forward Castes, Religious Minorities, etc) which is debatable and much debated. Dr. Edward de Bono, in his ‘Textbook of Wisdom’, says, “When a heads-on approach does not work, you have to explore new approaches’. He also says, when 2 people fight for a cake, instead of focusing on who to give it to (which will displease one of them), a creative solution is to make the cake bigger so that both can share it. But for the proliferation of self financing Engineering Colleges, India would have missed the IT revolution, and our economy may not have been as good as it is today. Opening up of engineering education to private sector led to mushrooming of Engineering Colleges. But it also helped avert nationwide unrest among youth on reservation issue, since almost everyone who wanted to study Engineering could get a seat in some Engineering College at reasonable fees. Lakhs of our Engineering graduates who studied in the self-financing Engineering Colleges (including a few from SC-STs, and many from poor/ OBC/ disadvantaged backgrounds) got jobs abroad or in India, and some became entrepreneurs, even if lakhs of others became unemployed or grossly underemployed. But for the proliferation of self-financing Engineering Colleges, India would have missed the IT revolution, and our economy may not have been as good as it is today. Though there was deterioration in the quality of Engineering education, on the one hand, there was also a certain level of demographic dividend that was reaped, on the other. Like stock markets make their own corrections, the poorly performing Engineering colleges are now being closed down, not because the Government clamped down on them, but because the market forces have rendered them surplus. Which I think is good, as the market is the best regulator. Though not by design, we thus solved reservation problem partly by opening many self-financing Engineering Colleges. Similarly, though the number of CAs who graduate every year is very small, there is less of entry barrier; the barrier is more at the exit (i.e., passing out stage). Here again, reservation is no issue because we give opportunities to most aspiring students who want to do Chartered Accountancy. Arts, Science and Commerce Education have long been open, and so reservation has been less of an issue. We need to replicate these experiences in all realms, e.g., medical education, para-medical education, teacher education, agricultural education, entrepreneurial education, higher education, etc. We should open up educational opportunities, removing entry barriers, and even giving some freedom for innovation by colleges. A lot more of our youth will then become doctors, nurses, paramedics, teachers, etc in villages and small towns, many will get jobs abroad, not only in developed countries but also developing places like Africa. And our shortages in all these realms will be addressed. This is like the opening up of the economy in 1991, but on a smaller scale, in the realms of Education & Training and Employment. Opening up of such educational opportunities won’t, by itself, create jobs, though many more will get employed than at present like it happened during the IT boom. This will at least address the supply side problems; we need to address the demand side issues as well, which we need to do anyway. I had written another article titled, “Creating Jobs In Jobless GDP Growth Scenario” , wherein I had outlined a proven model of training which can make our graduates of all streams far more generically employable than at present, which will help fill many job openings where employers are unable to get employable people now. The Government has set apart huge funds for such training, part of which is going unutilised, and part of it is squandered away wastefully. When we combine opening up of the education sector (for self-financed Colleges in just about every stream), with an offering of generic training for all students, we’re likely to solve the twin problems of Reservation and Employment to a significant extent. This is like the opening up of the economy in 1991, but on a smaller scale, in the realms of Education & Training and Employment. At some estimate there are about 40 percent of people fall under SC/ST definition in India. After seventy years of experiment with reservation, hardly 3 or 4 percent of those SC/ST succeeded in life of prosperity through education, yet rest 96-97 percent of SC/ST rewards political parties who support SC/ST reservation and punish any party which oppose the reservation. As a result, the political parties have taken these 96-97 percent of SC/ST people and their votes for granted and ignore doing anything for them by just supporting reservation. Instead of reservation lolly-pop, political parties should invest in changing the thinking of SC/ST people. Invest now so you get rewards later. Right nor SC/ST people would give priority to their children bring in 100 Rupees through daily labor today than wait for 2000-3000 Rupees a day after some years of schooling. Wikipedia says, “SC-ST comprise about 16.6 % and 8.6 %, respectively, of India’s population (according to the 2011 census)”. Their population when Reservation was introduced for them was about 15% for SCs and 7.5%. 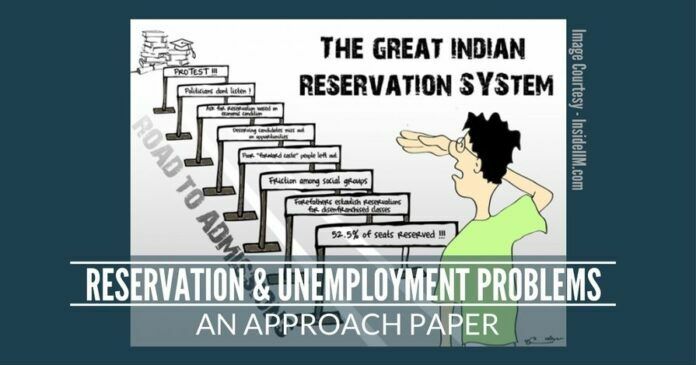 If reservation hasn’t helped them reach their share of % of population in education and Govt jobs (because there’s no reservation for jobs in private sector), it not only means SC-STs haven’t been able to benefit to the extent of their reservation despite lowering of standards for them at entry, but also that this reservation does not exist in practice, and obviously the unused % has only gone to the others; so, there’s no case for complaints from others. If somebody should complain, it is the SC-STs themselves. Most of the objection to SC-ST reservation is based on wrong notions, not facts. The real solution lies in affirmative action, going beyond reservation (not in lieu of reservation). I have outlined such a strategy in my article titled, “Need A Big Idea For SC-ST Empowerment” ( https://www.pgurus.com/need-a-big-idea-for-sc-st-empowerment/#comment-4306 ). The nation is broadly divided on this inssue into 2 camps, pro- & anti -reservation (whether it is SC-ST reservation, OBC Reservation, Minorities Reservation, or Income-based reservation. My article argues that there is no need for us to be divided; we can be united in solving the problem of scarcity, whether it is in educational or employment opportunities, by increasing the size of the cake to be so big that everyone can have her/ his share. This way, we need not try to solve the problem of reservation, but we can make it disappear, with no one opposing anyone else. We need not decide whether an individual should aspire for Rs 2000-3000 a day, or Rs 100 a day. Create plenty of opportunities in all realms, and each will find one’s own opportunities. Perhaps, my figure may have included OBC too. But any way, a very small percent of SC/ST people qualify even at the reduced standard, but rest of the SC/ST people strongly oppose doing anything to the reservation practice and vote accordingly. That is why political parties take their vote for granted and ignore their welfare. If SC/ST don’t qualify to fill their quota what do you suggest? Keep those seats vacant? Who would argue that increase the size of a pie would solve the problem? It is easier to say than done. Even in some expanded field of education, there is severe shortage of qualified teachers/professors in India and hence licenses of such schools are taken away. Haven’t we seen that some 90 percent of students failing MIT are from reservation? Would expanding number of MIT solve the problem? In America there is affirmative action. Even they have lots of complaints against that. At least America has much bigger pie. Totally flawed article. Reservartions is to be removed & replace it with economic condition combined with merit. Remove all OBC category. Make the education more strict with more modern content & make exams tough so that only those who qualify shall be required to cleared. Raise the bar of education delivery. Make mandatory that those who qualify the “Professional Exam” shall be called “Engineers” rest as “Technicians” i.e. mere getting a degree certificate does not quality a person to be an Engineer. Hindu philosophy of “Karma Siddantam” did not give concession to any caste, but qualified only those who really worked towards it. So apply this principle.